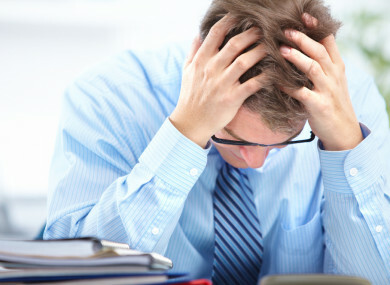 JOB-RELATED STRESS has doubled among employees in Ireland in recent years, a new study has found. Dealing with angry customers, time pressure and bullying are among the reasons people list for their work stress. Economic and Social Research Institute (ESRI) research, funded by the Health and Safety Authority (HSA), has found that job stress among employees doubled from 8% in 2010 to 17% in 2015. However, the level of job stress in Ireland was still below the average for 10 western European countries in 2015 (19%). Workers in Ireland were more likely to report the pressures of emotional demands and exposure to bullying, harassment and other forms of mistreatment, but less likely to report time pressure than their western European counterparts. Employees in the health sector (18%), public administration (16%) and the manufacturing sector (15%) experience the highest levels of job stress. The occupational groups most likely to experience job stress are technical/associate professionals (20%), professionals (16%) and managers (14%). Emotional demands: such as dealing with angry clients/customers or having to hide emotions while at work). Those experiencing high levels of emotional demands were 21 times more likely to experience job stress than those with the lowest levels. Time pressure: such as never have enough time to get the job done, work to tight deadlines). Those with the highest levels of time pressure were 10 times more likely to experience job stress than those under the least time pressure. Bullying, harassment, violence, discrimination: those with the highest exposure were eight times more likely to experience job stress than those with no exposure. Unsurprisingly, employees were less likely to experience stress if they experienced support from co-workers and managers, felt their job was useful or had a feeling of work being well done. Employees in Ireland enjoy relatively high levels of support from managers and co-workers, the research found. However, these factors had less impact on levels of job stress than the demands listed earlier. The report highlights the importance for Irish businesses to have policies in place to deal with job stress. Under health and safety legislation employers have a duty of care to protect employees against any personal injury to mental health arising from job stress, the researchers note. International studies show that job stress is linked to poor physical and mental health outcomes such as cardiovascular disease and depression, and to negative impacts for firms through absenteeism, increased job turnover and reduced morale. The ESRI said this has a knock-on effect on government finances and the economy more generally. The report shows that the most urgent need for action is in addressing psychosocial risks such as bullying, harassment and violence, high levels of emotional demands and time pressure. “Job stress is becoming a more important issue in the Irish workplace as the economy becomes increasingly service-based. Employers need to manage these risks to prevent the significant individual and organisational costs of stress-related illness”, Dr Helen Russell, an author of the report, said. Email “Angry customers and bullying: Why job stress in Ireland has doubled ”. Feedback on “Angry customers and bullying: Why job stress in Ireland has doubled ”.